The Soft Science Cabinet, Apis Cerana, is an installation that articulates the particular methodology of ethology as the study of animal behavior using a combination of laboratory and field research and the question of possible epistemological and ontological relationships with nature and language. Ethology has been founded in the 1930 by biologists, and being a soft science like ecology, it went through a controversial phase in its early stage of development. Karl Von Frisch, one of the founding father of this new discipline, is famous for his life long research on the language of the bees, and established the fact that bees have this common element with humans and lower primates of having an abstract language. In many ways, Von Frisch’s studies show the ability of bees, and to a certain extent to of other insects, to be flexible and to adapt in many ways through complex mental operations. Commonly, for us to grasp this thought, one would think of the prominent role of language as being the base of human intelligence, and thus points out at the dependence on language that might limits our capacity of imagination. Indeed our way to consider animals might be trapped within our language based thinking process. Beyond the epistemological questions, Hugh Raffles states “there are other ways of approaching this through thinking about what it is that things do – a more ontological set of questions. Thinking of other things – it could be a table or a cup or it could be you or me, or a bee – you can think about what it is that gets contained in those things at a particular moment that you are paying attention to it. And then what happens through it and in relation to it, what it does in the world.”1 The issue that arises is the question of the Other and our possible ways of engagement. The form of this installation refers directly to the protocol of the method used in ethology, through a certain scientific aesthetics and an idea of collecting observations through field research. As such, it also directly points at the origins of the cabinet of curiosity that appeared in Europe during the Renaissance. What is collected here is the trace of the recording of sounds from inside and outside a beehive that have been imprinted on two aluminum plates coated by natural bee wax. This clearly states sound as being a form of knowing that can be used for scientific and anthropological purposes. Throughout history, the act of listening and recording were once at the core of medical diagnostics with the practice of auscultation for instance, or as a way to record faraway tribes or societies with particular political and anthropological perspectives. In a similar historical thread, the use of bee wax resonates in the history of sound recording, at a time when it was used to coat cylinders for the early recording devices. In addition, the act of recording has been a stepping stone in the discovery of objecti cation of sound with the possibility to separate a sound from its source, that lead to open up new potentials for the act of listening. The grooves of the two bee-wax LPs are the traces of the original sound recordings, which is made of close-microphone recordings from within and outside a beehive. Yet, in the sound composition, These sounds are layered and mixed with spectral processing, as a way to work within the original spectrum of the sounds, a possible metaphor for dissection. Within these layered sounds, readings from Karl Von Frisch’s The Dancing Bees 2 can be heard, illustrating several scientific protocols of his experimentations, as well as the peculiar relationship established between the researcher and its subject. This mixture of sounds aims at a possible sonorous hybridization of the human and animal voices. 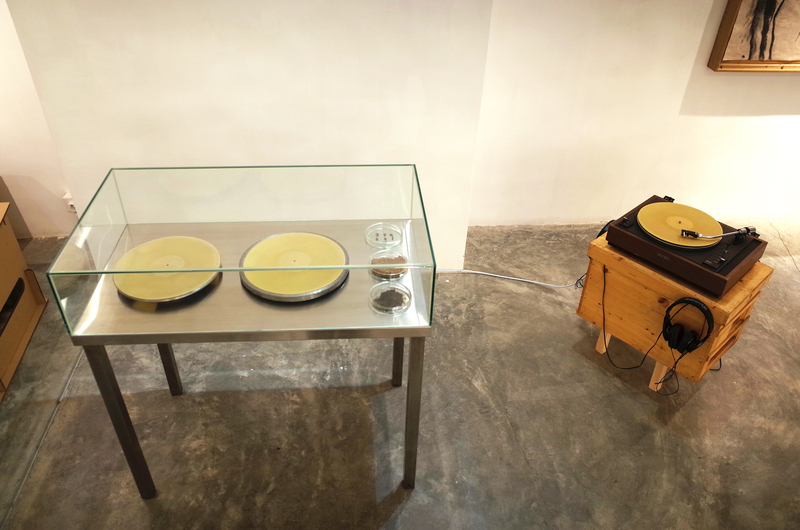 In the end, these two bee-wax plates, enclosed and protected in their cabinet, also carried the idea an impossible record to be played, as the needle of a record player would destroy it instantly. A duality is therefore set between an act of recording without any possibility to listen. 1 Sina Naja and Hugh Ra es, The Language of the Bees: An Interview with Hugh Ra es, Cabinet Magazine, Issue 25, Spring 2007, http://www.cabinetmagazine.org/issues/25/ra es.php accessed on 28th May 2012. 2 Von Frisch, Karl. The Dancing Bees. London: Methuen & C0, 1954.